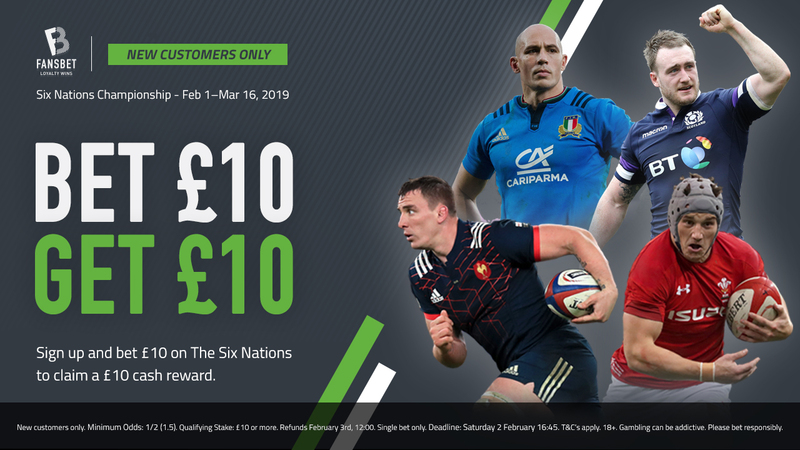 Check out our preview, betting tips and enhanced odds for round two of the Six Nations with former internationals Jim Hamilton and Andy Goode. The Six Nations continues this weekend with round two action and if the opening exchanges were anything to go by rugby fans are in for a treat. All three games delivered performances of note in the opening round, France will be rueing their loss after squandering a 16-point half-time lead to the Welsh, Scotland underlined their attacking quality with five tries in a convincing win over Italy, while in the game of the round England stunned Ireland 32-20 in Dublin, in what is unquestionably Eddie Jones’ best team performance as England coach. Former internationals Jim Hamilton and Andy Goode scrum down again with their previews for round two and if you are after some value then check out our selection of enhanced odds available for all the games. Enhanced Odds For The Six Nations. Max Bet £25! England were simply brilliant in their win over the Irish, unquestionably one of their very best performances in recent years. In the backs, Owen Farrell yet again led from the front constantly exploiting Robbie Henshaw’s positional play at the back, Manu Tuilagi was immense in both attack and defence in the midfield, while Jonny May underlined his credentials as one of the best finishers in the game. In the pack the Vinapola brothers showcased their value, in particular Mako who was superb. Maro Itoje unfortunately will not feature after suffering a knee injury, however England do have plenty of quality to call upon in the second row. Jim Hamilton and Andy Goode preview the action for the final game of round two. England v France Odds Here! Scotland will fancy their chances coming into this, however a wounded Irish will want to set the record straight with a performance of note. Their opening performance against England left a lot to be desired with Robbie Henshaw’s selection at fullback not the best of Joe Schmidt’s reign. Scotland on the other hand looked superb albeit against an Italian side that lacks quality. Their attacking approach is becoming a hallmark of their game with both Stuart Hogg and Finn Russell leading the way from the back. Former Internationals Jim Hamilton and Andy Goode give their verdict ahead of the game and give their predictions. Scotland v Ireland Odds Here! Italy will be looking for a much-improved performance at home this weekend although they are taking on a Welsh team that what won their last nine international matches. Warren Gatland will however be concerned with their first half performance which saw them 16-0 down at the half and were effectively gifted the result by some rather poor French errors. That said the Welsh are beginning to stake a claim with their unbeaten run and should do the job over in Italy. Jim Hamilton and Andy Goode give their verdict and predictions ahead of the game. Italy v Wales Odds Here! Italy: 15 Jayden Hayward, 14 Edoardo Padovani, 13 Michele Campagnaro, 12 Luca Morisi, 11 Angelo Esposito, 10 Tommaso Allan,9 Guglielmo Palazzani, 8 Sergio Parisse (Captain), 7 Abraham Jurgens Steyn, 6 Sebastian Negri, 5 Dean Budd, 4 David Sisi, 3 Simone Ferrari, 2 Leonardo Ghiraldini, 1 Nicola Quaglio. Wales: 15 Liam Williams, 14 Jonah Holmes, 13 Jonathan Davies (captain), 12 Owen Watkin, 11 Josh Adams, 10 Dan Biggar, 9 Aled Davies, 8 Josh Navidi, 7 Thomas Young, 6 Aaron Wainwright, 5 Adam Beard, 4 Jake Ball, 3 Samson Lee, 2 Elliot Dee, 1 Nicky Smith. Replacements: 16 Ryan Elias, 17 Wyn Jones, 18 Dillon Lewis, 19 Alun Wyn Jones, 20 Ross Moriarty, 21 Gareth Davies, 22 Gareth Anscombe, 23 Hallam Amos.